Bed bugs are invading every area of the United States and the world. What are they? Where do they come from and how does one get rid of them? This information will help you search, find and permanently destroy them before they take over your home. To get you started, just click and play the video below to learn more about bed bugs without reading another word. First of all, they are blood suckers. They love any warm-blooded animal from human beings to bats and will readily feed on them if given the opportunity. They are creatures of the night for the most part, and will only come out in the daytime if they are hungry and a warm-blooded animal is available. When they are present in larger numbers, there is a detectable, disgustingly musty yet sweet smell that accompanies them. The average bug is about 1/4" long. It is an oval-shaped, flat creature with short, golden-colored hairs on them. Their beak is made up of 3 segments suitable for penetrating the skin and sucking blood from their host. They also move very quickly and can travel up about 20 feet to reach a feeding host. Females attach their eggs, pearly white in color, to any surface that's handy in order to hatch them. Usually, the eggs will be laid in crevices such as mattress and box spring edge seams. The females will lay around 200-500 eggs in their lifetime. They lay these eggs at the rate of 2-3 eggs per day. These unwanted, gross little creatures live for up to 12 months and will feed every 3-5 days if their is a host available. Because of their ability to adapt and survive in any environment suitable for their human hosts, they can become established and develop significant populations very quickly. Typical reactions to being bit are raised, reddish bumps at the bite location or itchiness. Humans who are frequently bitten may develop a sensitivity “syndrome” that can include nervousness, almost constant agitation, jumpiness, and sleeplessness. These symptoms may be helped by eradicating the bed bugs or moving the person to a "safe zone." These bugs generally move from one home to another in many different ways. The bugs or their eggs are unknowingly carried in or on pieces of furniture, bedding, luggage, clothing, electronic devices or cardboard boxes. Here's a brand-new Bed Bugs Guide. It's called the "Bed Bugs Uncovered Guide"
how to get rid of bed bugs forever! Renting or buying used furniture are rather common ways they are moved, especially in poorer communities, and this undoubtedly helps to quickly spread bed bugs to new sites and redistribute them back into places from which they may have been eliminated earlier. In multi-unit housing situations, getting rid of them becomes a huge challenge that is often only successful when the whole community joins together and coordinates their efforts as a unit. There are numerous ways suggested to kill bed bugs such as using high heat in an infested home and hiring fumigation specialists to rid you of them. The following are some tips in which you can attempt to free your home of bed bugs without hiring outside help. Heating a home up to above 113 degrees F for a prolonged period of at least 24 hours. Although bed bugs can't survive in heat above 113 degrees F, there's no way to tell if the whole home and every hiding place in it has reached this temperature so it's effectiveness would be very subject to question. Some people have tried encasing their mattress and boxed springs in black plastic and setting it out in the direct sun for a few hours. This method has been proven to produce less than desirable results. The slow heating allows the pests to move from hotter areas to cooler ones to seek protection from the heat. Also, the top may reach high enough temperatures to kill them but the bottom probably won't. The use of steam for killing them would be more effective because you know the any area you subjected to the steam would produce enough heat to instantly kill them. Precaution needs to be taken though to ensure that you don't damage materials with the steam. Also, steam can be harmful to you if improperly handled so we advise against anyone using this method. You will need to keep your rooms free of any unnecessary debris such as dirty clothing so that you eliminate places for bed bugs to hide. Caulking all visible cracks in walls, floors and other areas will also eliminate the places that they hide and deposit eggs. In the long run, you will be far ahead of the game to get a professional pest control agent involved. They have methods that not only kill the varmints, but leave residuals that will help control future infestations. 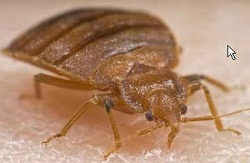 The Harvard School on Public Health recommends preparing your bedding against access by bed bugs. This method of getting rid of bed bugs is known as encasement. If you have an encasement cover that denies access to bed bugs, you can keep them from entering their favorite hiding places in your mattress and boxed springs. Also, these encasement covers are washable and dryable at heats that instantly kill them and remove their sticky eggs. This is one of the best ways to work in conjunction with your pest control agent to insure against long-term survival. * The information contained on this page is for informational purposes only and none of the methods mentioned for eradicating pests is meant as advice or suggestion to be used by anyone. It is recommended that the services of a competent professional pest control agent be obtained when dealing with any pest.